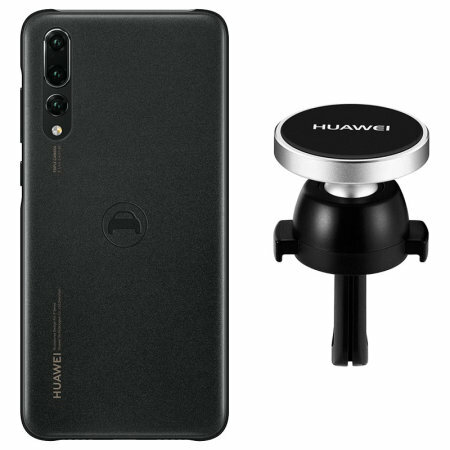 Hold your phone safely in your car while shielding it from damage with this official Huawei P20 Pro magnetic car holder / protective case combo for your Huawei P20 Pro. Very disappointed with this product, I waited an excessive amount of time for it to arrive, when it did I was excited to use it! Lasted a week and on a standard ‘A’ class road, in normal driving, my phone slipped and fell! Thankfully I had previously purchased the Olixar Huawei P20 Pro Tempered Glass Screen Protector (EXCELLENT PRODUCT ⭐️⭐️⭐️⭐️⭐️) saved my screen! Sadly it broke but it did it’s job, something sadly the holder did not! Came after two weeks in Canada but so far is the best case for my Huawei P20 Pro. Nice feel and does it's job. The only concern is that I'd like to see a higher front lip on the case to protect the front screen, it is flush. This cover is a great simple, low-profile option from Huawei itself so the fit and finish is consistent with the phone. The nice added feature is the built-in magnetic plate so that it can attach to car vent-mounted magnetic holders (either Huawei's or 3rd party like I have). Not the cheapest cover, but worth it in my opinion. Sorry to hear you are not happy with this case. I can assure you our cases our genuine. Can you please contact our Customer Services team so we can look into this for you. Good package, strong magnet but it doesn't fit my A3. A list of compatible or not compatible cars would have prevented a wasted purchase. I found its not sensitive on magnetic, wanna return for refund. Well folks this is it. The clear winner of best case in my opinion. I have tried a lot of different ones and there are some really good ones out there but this one suits my needs perfect. It works with a magnetic car holder, It's nice and grippy, It covers the corners, you can use a glass screen protector with it and it looks good. Every other case has failed in at least one of these areas. The biggest plus for this one is the feel. I have yet to find another case that feels this good in the hand. Even the other official Huawei case dosent feel this good. I'm about to buy another one just because I like haveing backup if it's needed. I say get one and you will love it. Really pleased with this case. The finish is tactile and transforms the slippery P20 Pro into a highly functional device. It's also very slim, so the phone is still manageable. Arguably not the most protective case out there, but if you take reasonable care of your phones you'll probably be happy to take your chances. I haven't tried the car magnet yet, but I guess it should work. After the case not being in stock when it says it was. They were quick to respond and let me know. That's fine. But once back in, i asked for next day delivery which they said is fine and then they didn't deliver their promise. Shame. I've tried all official covers for P20 and this is the best one even if you don't have a car magnetic holder. The choice of materials and the soft rubber back makes it a perfect cover. Highly recommended.